- Moonshine for his work on ME2 and ME3 which inspired me to make this MOD. - Heff for all his techincal support. - Machine4578 and eezonaut for there relentless enthusiasm and testing. - BarderothReturns for her config only mod which found all the xbox interfaces that weren't broken. - For extra testing: libm, daninthemix, MotokoKusanagi34, b3ft, Gikoku, Daiyus, rjms1974, Mivey and arkhamtheknight2. - The creators of the tools used: ME1Explorer, JPEXS Free Flash Decompiler and UE Explorer. - Removing MEUITM binaries and updating instructions. - Changes the "cancel" button to "back" in the load/save screen. This should now be localisable. 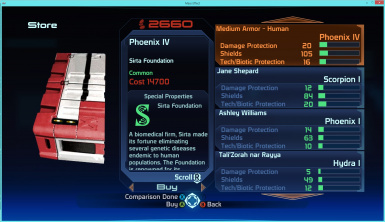 - Changes the quasar ui to be the one from the xbox. - Reduces the subtitle and conversation wheel font size to match the PC version. Size 22 to 16. - Changes the behavior of the X/B button when drawing/holstering your weapon. This should now work like the xbox. - Adds an out of combat run speed boost when holding the A button (Not just a camera angle change). - Adding a 50% drop in right stick sensitivity when zoomed in. - Further tweaks to correct mistakes in the tutorial strings. - Fixes Mako control weirdness introduced by the sensitivity changes in 0.3.0. - Fixes map control sensitivity for differing frame rates. - Controller sensitivity for camera movement changed based on frame rate. The higher the frame rate the more sensitive the stick. sensitivity. I've tweaked the maths so it should now take this into account. - Fixes the conversation wheel so no option is selected when the Left Stick is in the resting position. - Adds button shortcuts ([A], [B], [X]) for the options when starting the decryption mini-game. - Adds additional control over the decryption mini game. = Left Stick now operates like the DPad. - Updates the icons on the scoreboard in Pinnacle Station to be the correct controller icons. - Allow user to enter custom name during character creation. Keyboard required. - Removed back buttom from Mission Control (aka pause menu) and replaced with "Resume" button from XBOX360 Mission Control. - Removed buttons from load/save screen. These have been replaced with the controller bar. - Added 's around controller buttons in tutorial messages. - A couple of tutorial message updates. - Switched compression over to 7za. - Removes the inverted Y axis by default. - Fixes the DPad squad orders to match xbox 360 controls. - Fixes Conversation DeadZone Issue in the conversation wheel. - Changes the way the Mako zoom operates to be like the XBOX360. This could be a risky change as I'm using a class variable called m_nCurConvSelection to hold zoom state. I'm guessing this variable doesn't operate outside of a conversation. Fingers crossed. - Fixes the intermittent crash when browsing the map (hopefully). way it would have been on the XBOX 360. - Allows the Quasar game at the back of Flux to be played with the controller. - Allows the mini game to activate the laser to save liara to be cancelled. - Allows better control over the mini game to activate the VI on Noveria. 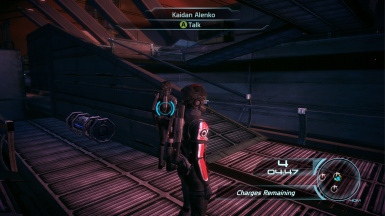 - Fixes the accidental mapping of mako thrusters to the Y button. - Fixes the problems experienced by players when selling items at a shop. 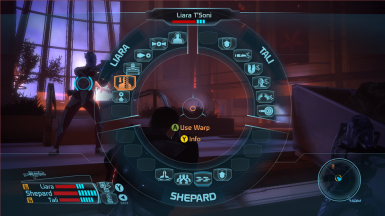 - Fix Tutorial messages for Femshep. - Switch Mako thrust to the A button. X button is supposed to be for leaving and going back to the Normandy. - Updated Tutorial messages to reflect controller commands. - Fixes icon not getting updated when uninstalling xmods. - Increases Right Analog Sensitivity for aiming. - Fixes Right Analog scroll on the inventory screen. - Fixes Right Analog scroll in the galaxy map. - Fixes dead zone problems in the galaxy map. - Fixes sensitivity issues for some controllers. - Uninstalling xmods will now work but the icon will not show as blank. Still needs work. - Removed debugging when pressing LB and RB. - Removed the ability to mark up a mapped power with RB when out of combat. - Added LB tap for last weapon switch. - Switch around keys to map xbox original and add Mako thrusters. - Switched DESIGNER_UI back to the PC version. 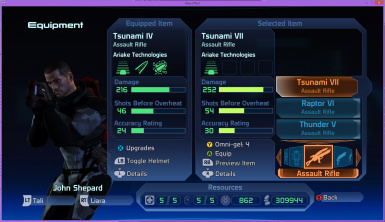 Looks like this was another minigame for doing things like activating the mining drill to save Liara. 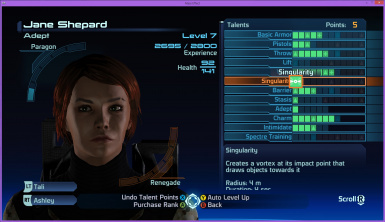 This MOD adds full XBOX 360 controller support for playing Mass Effect 1. The Mass Effect game shipped with all the original XBOX controller interfaces but in a very broken state with some functionality removed. This mod corrects these issues and re-implements features where necessary. The MOD switches over to use all the xbox user interfaces, with the exception of mini games/loadsave and settings. These exceptions have been adjusted to work with the controller. IMPORTANT: There are TWO INSTALLATION DIRECTORIES. One inside your user profile, one inside the game directory. 1. Run the game at least once to create the games profile settings. 2. Extract the files from the archive using winrar or 7-zip. IMPORTANT: Do NOT copy these config files into the game folder, they need to go into the user profile. If you see "Default<name>.ini" you are copying it to the wrong place. must change them back to "read only" before launching the game. 4. 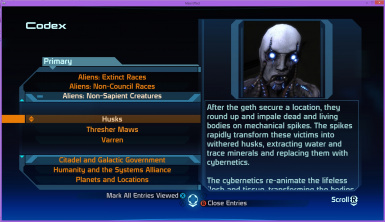 Copy the contents of "Mass Effect" directory to your install directory overriding the originals (Back them up first). These files should override the original files. You have copied the config correctly but you have not overridden the game binaries. You have ignored the instructions and you have copied the config into the game folder (The one with all the default<name>.ini files). These need to be copied to the user profile. You have not copied the config correctly. Or the config files are not being copied as "readonly" right click on them and check that they are marked as readonly. - Controller doesn't work, can't get past "Press Start". This MOD will only work against the primary Xinput controller. Check you don't have other XInput wrappers or controllers attached. The disable option doesn't work through the menu. The binaries from here should help disable vibrations. - Parts of the HUD are cut off. This MOD does not support 4:3 resolution. Use the MassEffectConfig.exe to change to 16:9. - Inverted controls, Sensitivity, dead zone. For some reason some users complain of inverted controls and not being able to change sensitivity using the method below. Left is for Left stick, Right for Right stick. X for X Axis, Y for Y Axis. The first number is the sensitivity. Changing it below 1.0 will reduce sensitivity. Adding a - will invert the axis (e.g. -1.0). The second number is the dead zone. Increasing this number will increase the controller deadzone. REMEMBER to set the bioinput.ini file back to "read only" before you launch the game. Still struggling with the installation? Try watching this video from Stiff Kun (my thanks). This mod uses the same controls as the xbox 360. These can be found here. The Y axis can be inverted in the setup menu.